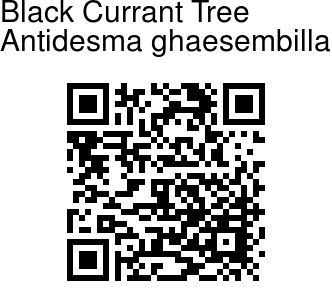 Black Currant Tree is a tree, up to 12 m high, bark grey, branchlets brown or greyish, warty, greyish, yellowish, brown or ferrugineous-tomentellous, becoming hairless with age. 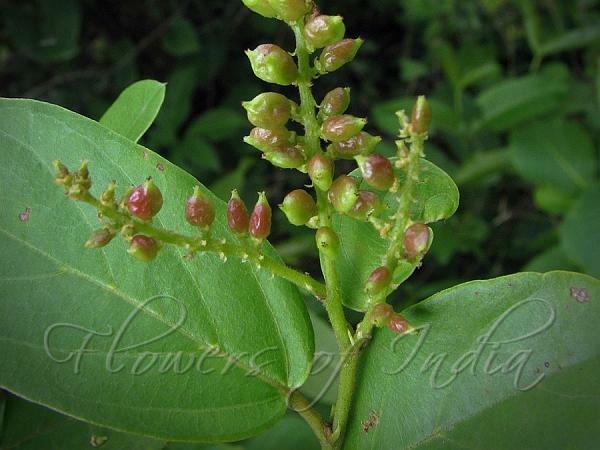 Leaves are simple, alternate, stipulate; stipules lateral, 3-8 mm long, linear or lanceolate, deciduous. Leaf-stalks are 3-25 mm, slender, velvety, blade 2.5-14 x 1.5-10 cm, oblong, oblong-elliptic, obovate, suborbicular or ovate. Base is round, heart-shaped, flat, subacute or obtuse, tip round, blunt, retuse or apiculate, margin entire, papery to thinly leathery or sometimes membranous, glabrous or sparsely pilose on midrib and lateral nerves above grey or fulvous tomentellous to thinly pilose beneath, lateral nerves 3-7 pairs, parallel, slender, prominent intercostae reticulate, prominent. Flowers are unisexual, reddish-yellow; male flowers: in terminal and axillary much branched spikes; peduncle densely brown or fulvous tomentose; bracts 1-5 mm long, linear or narrowly ovate, densely pilose; perianth ca.1.2 x 1-2 mm, cupular, densely pilose or tomentellous outside, lobes 5, ovate, acute; disc glands free, inter staminal, pilose towards apex; stamens 4-5, 1-2 mm long; anther cells orbicular; pistillode obconic; female flowers: in terminal and axillary branched or simple racemes; peduncle densely brown or fulvous tomentose; pedicel 0.8-1.5 mm, densely pilose; perianth cupular, 1-1.5 x 1.5-2 mm, densely pilose outside, lobes 5, elliptic, ovate or linear-oblong, almost free, acute; disc annular; ovary superior, 1-1.5 mm long, 1-locular, ovules 2 in each cell, ellipsoid to oblong-ellipsoid, often oblique, tomentose; styles terminal. Fruit is a drupe 4-6 x 3-5 mm, compressed-orbicular, glabrous, reddish-brown or black, alveolate.